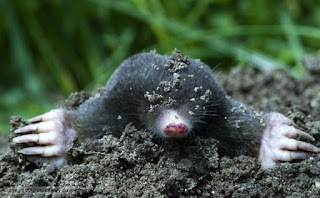 The Labour Party has clearly been infiltrated by moles, sleeper agents, call them what you will, slyly doing the bidding of their masters, the nefarious and shadowy fiends who control the National Government. That, at least, can be the only explanation for the Labour Party's almost heroic dedication to ensuring it is never again elected to office. Well, I suppose it could be put down to a degree of stupidity and political naivety not seen since Chamberlain returned from Munich to say what a nice chap that Adolf was, but I think it more plausible that agents of the right have succeeded in sinking the cause of the left. The most signal achievement to date of these agents is the selection of David Shearer as the Labour Party's leader. Is there anyone less inspiring, less articulate, less likely to win a raffle, let alone a general election? Shearer is, undoubtedly, a very nice man. His heart, as they say, is in the right place. He has worked to bring the light of humanitarianism to those who suffer all over the world. And that is admirable. But humanitarians don't win elections, at least, if they do, it's not because they're humanitarians. Elections are won by those who inspire and have a vision, who are articulate and charismatic, who can convince the people that, if only they follow, the Promised Land will be theirs. Being nice is not enough. Being clever is most definitely not enough (indeed, it can be a positive hindrance). Having a clear grasp of all the details of all that's happening in the world is not enough. What matters is that you sound like you know what is happening, that you appear authoritative, that you act as one who was born to lead. The average voter hasn't the time, nor the inclination, to be concerned with details. The collective citizenry vote with their instincts, not their heads, and their instincts are rather blunt instruments. Thump them over the head with the message that you'll best represent their prejudices, and their votes will be yours. One of the moles that has infiltrated the Labour Party. John Key may mumble, but even his mumbling is articulate enough to pass muster, and besides, his smile is so reassuring, one hardly notices the mumbling. We're too busy basking in the reassuring glow of his smile. Until the Labour Party comes to its senses, ejects the agents of the right, and chooses a leader who can actually lead, they will languish in their haplessness. Someone more like that nice Adolf then?